When building a new private house or overhauling an old manor, many owners face the question: how to build a staircase to the upper floor correctly? So that the building itself in the future would be safe for all households and guests, as well as be able to serve the owners for quite a long time? Stairs in private houses and even in duplex apartments have long become a central part of the interior of the entire dwelling. 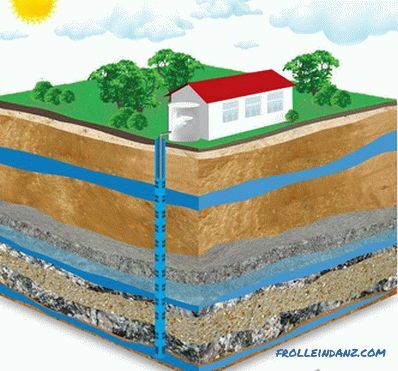 Therefore, when designing a house, it is necessary to pay due attention to its appearance, functionality and safety. Therefore, in the construction of such a structure is required to take into account a number of mandatory factors that depend on the structure itself and its size. Here take into account the required area for this device, the height of the house, the expected load, ease of use and the material from which the model itself will be built. 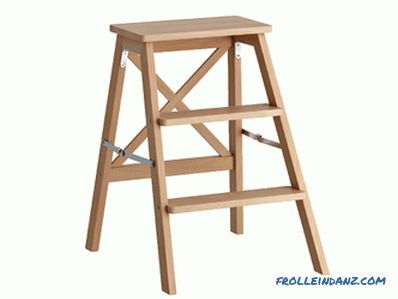 To date, there are a variety of ladders of various designs, so experts divide them into several types. Such a division directly depends on the functionality, location, purpose and material of manufacture. Marching design. Among private developers, this type is the most popular. 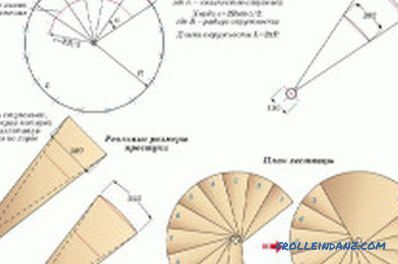 But before proceeding to the construction of the stairs to the second floor, it is necessary to perform the correct calculation of the slope of the structure, the number and height of the steps. First, measure the exact distance from the floor to the ceiling along the wall where the structure will be installed, add the thickness of the ceiling, then divide everything by the height of the steps. Usually the step height is 15 cm. Such a simple calculation helps to determine the exact number of steps. It is important to remember that this type of structure consists of marches, each of which should have no more than 15, but no less than 3 steps. If this rule is not taken into account, then it will be difficult for people to climb such a ladder. In the usual flight of stairs has 10 steps. The marching type is also distinguished by the type of attachment, they are set using kosourov or bowstrings. The kosurny design is based on a tab of steps in special "saddles". This model is most simple for beginners who decide to build a ladder on their own. Bowstring models have support beams, they are more complex in design. Scheme for calculating the flight of stairs. Screw design. The spiral staircase to the second floor is preferably installed in rooms with a small space. 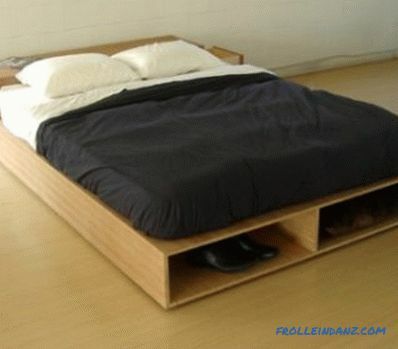 Although such designs take up little space, they are not very convenient to use. It is not difficult to calculate the space from the first floor to the second, which is necessary for installing the stairs. The area under the helical structure directly depends on the size of the steps. Usually the length of the step in this case is from 50 to 100 cm. The basis of the screw design is a metal stand, around which the steps are fastened in the form of wedges. That is, the area under the screw model will be the rack itself and the step width along the entire circumference of the rack. Construction on bolzah. To build a ladder on the Bolets, a wall to which the steps are attached is required. This model seems easy from the outside, but in fact it is particularly durable and reliable. 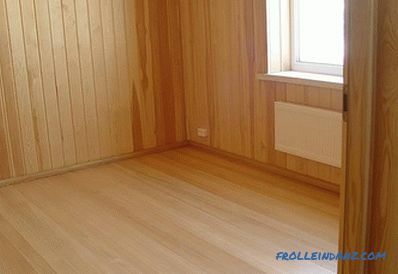 It is important that bolzovye designs give the maximum opportunity to penetrate the sunlight in the room. And for the construction of buildings often use elegant rails, which give it a special look. After choosing a site and carrying out a full calculation, some developers ask their friends, who have already begun to erect a staircase at home, the question: “What material are you building from? ". After all, it is important to choose the right material, since it depends on how much the installed staircase to the second floor will be reliable and how harmoniously it will fit into the interior of the house. The classic version is a wooden model. Some choose a combination based on concrete, metal, reinforced concrete, using stone, ceramics and glass to solve the problem of how to build a ladder and what material is best to use. Scheme of a spiral staircase. But only professionals with a special brigade of workers are taken for the construction of such structures. 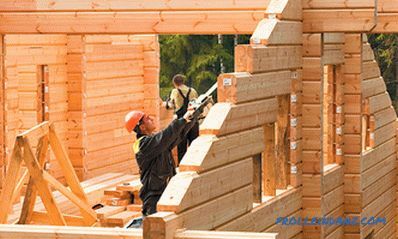 The construction of a wooden model is more suitable for self-construction. 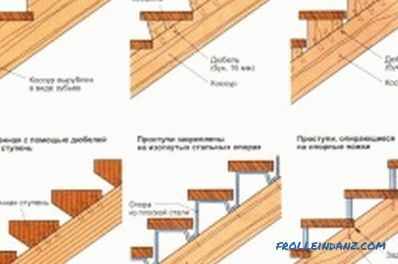 The main types of wooden stairs include marching and screw structures.In turn, the marching structures are divided into straight and turning. Direct marching models are easy to manufacture and easy to use. But if there are more than 10 steps, then the march is divided into 2 parts by a turning platform. The advantage of the second option over the first one is immediately noticeable, since at the same height the structure takes up much less area. Before you start building the stairs to the second floor, you should determine the geometric shape of the opening of the planned structure. The screw model is performed in a spiral circle, and the marching model is created on the basis of a rectangle. In this case, use a simple model - with zabezhnymi steps, which are mounted using kosoura. 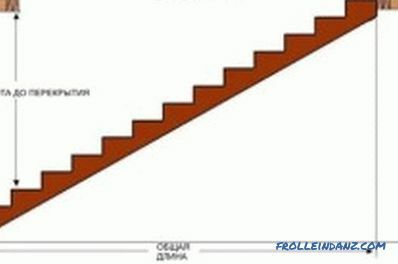 Usually for the construction of the stairs use the angle of 30 to 45 degrees. This angle is considered the safest and most convenient for the movement of a person by design. The riser is usually from 14 to 16 cm, with a height of 12 to 20 cm. The step is most practical to do up to 33 cm in depth. 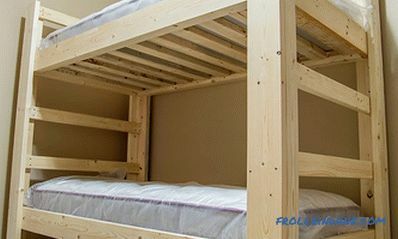 Before you begin to install the steps, you should choose how the kosour will connect to the upper floor. It is attached to the beam of the second floor or under the bridge so that the final step is the floor of the upper floor. With the help of the square for the markings, the patterns and the pencil, it is necessary to note the dimensions of the step on the kosour. By means of an electric saw, steps are carefully cut out, and upon completion of the work, the edges of the parts should be processed with a hand saw. Taking the finished part, it is necessary to mark other skirts. Next, you need to cut the steps and steps, while not forgetting to leave room for a ledge under the step, which is best left from 2 to 4 cm. To make the edges of the blanks look tidy, it is desirable to process them with a round mill. Installation work begins with the installation of a support column and mounting of risers on it. The structure is fastened with screws, and for even greater safety, liquid nails are used additionally. The self-tapping screws fasten the prepared kosour on the outline to the wall. The steps are connected to the kosour also by means of screws. From the open part of the staircase they set up a string, they fix balusters, handrails and decorative elements. Balusters and other items can be purchased at a specialty store. When deciding to build a staircase with your own hands, you should be ready for a complex and painstaking work, where there are calculations and material selection. But, knowing how to build a staircase on your own, and with due patience, you can make this design a significant element of the entire room, which will immediately attract the attention of guests.